TORONTO - The Canadian dollar closed higher Wednesday as the greenback fell back a little on worse than expected U.S. retail sales. The loonie rose 0.38 of a cent to 88.83 cents US after plunging 7/10ths of a cent on Tuesday. The greenback eased somewhat as data showed that U.S. retail sales for September fell 0.3 per cent amid broad weakness. Economists had expected a 0.1 per cent decline. Other data Wednesday from the Federal Reserve showed the U.S. central bank’s latest economic survey indicated that most regions saw modest or moderate economic growth in September. However, the loonie was volatile, coming back from a low of 87.84 cents US as investors opted for safety and bought into the U.S. currency. The benchmark U.S. Treasury yield stood at two per cent Wednesday afternoon, down 0.2 of a point from Tuesday after having moved as low as 1.873 per cent. "All eyes are once again on the risk fallout across a number of markets (but sorely concentrated in oil) with little in the way of let-up overnight," said Mark Chandler, head of Canadian FIC strategy at RBC Dominion Securities. "The weakness in oil prices is spilling over in a nasty fashion in Canada." 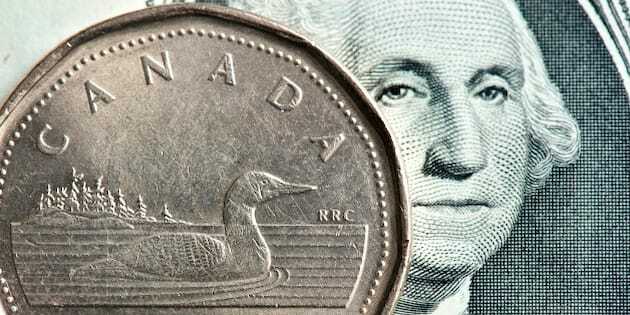 The commodity-sensitive Canadian currency has suffered from oil prices that have plunged recently to 2 1/2 year lows after the International Energy Agency slashed its oil-demand growth forecast for this year by more than a fifth. The November crude contract edged six cents lower to US$81.78 a barrel. The higher U.S. dollar helped depress other commodities as December copper gave back eight cents to US$3.01 a pound while the flight to safety pushed December bullion up $10.50 to US$1,244.80 an ounce.